If you’re yet to decide what bird to buy this Thanksgiving, then sit yourself down and tuck into this turkey chart from ChefSteps. 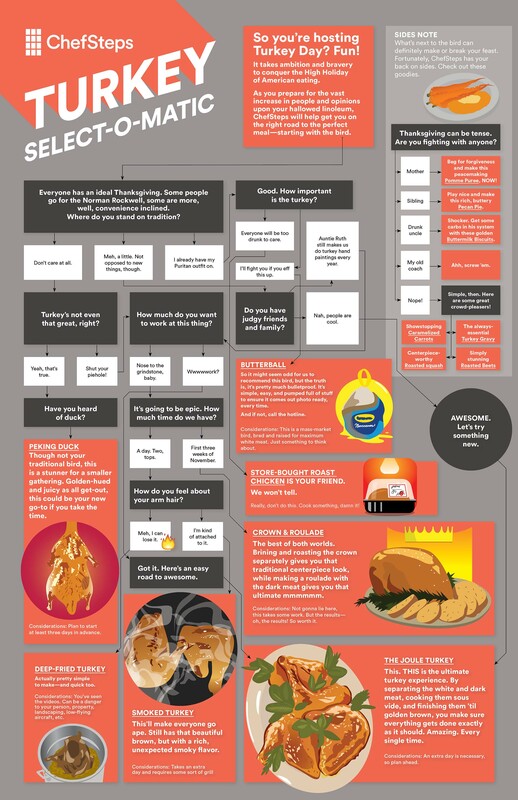 The simple flow chart helps in deciding exactly what turkey you should buy for Thanksgiving and exactly what you should be doing with that turkey based on your tastes. It’s quite fun to go through, but there are also some great suggestions on how to go about cooking up the turkey with style. We’ve also included a really useful video from ChefSteps that shows you exactly how to butcher a Turkey with expert precision. If you’re the one in charge of the bird this Thanksgiving you’ll be glad you saw these useful resources.